The "Pastorelas" are a sequence of pastoral or "countryside" plays enacted in Mexico during the Advent season leading up to Christmas. In the plays, the devil attempts to prevent the shepherds from making their way to witness the birth of Christ. The Archangel Michael assists and protects the shepherds on their way. 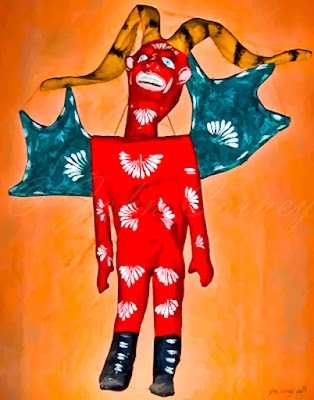 This is why if you visit Mexico in the weeks leading up to Christmas you may well be surprised to see effigies of the devil like this one that I photographed in Alamos when I visited at Christmas time a few years ago. Prints of this "Pastorelas Devil" can be purchased from my collection at Imagekind.